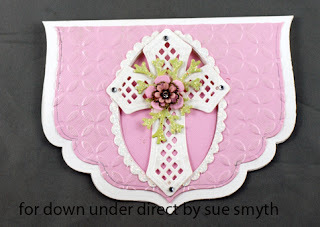 The new Crosses 2 Spellbinders, make a lovely Christening or wedding card, combined with the new M-Bossibilities you will create a card with a beautiful softness. 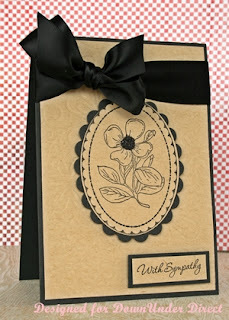 It's Tutorial Tuesday time again, and today I have a tutorial for making Grunge Flowers. 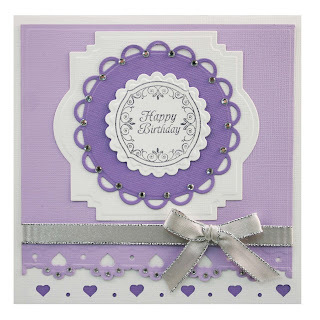 Using Grand Dahlia, cut out four of the smallest flowers from the Grunge Paper. 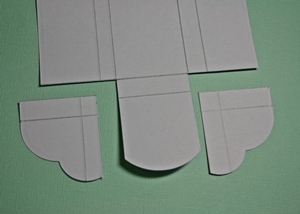 You may need to run the paper through the cutting machine twice as it is quite thick. Although it will look like it hasn't cut properly, you will find the shapes pop out quite easily. Ink one side of the flower using the inkpad to apply the ink. Using a darker ink, lightly ink over top of the first coat of light ink. When dry turn over and cover the back of the flowers with the dark ink. Stack the petals one on top of the other with petals opposing. 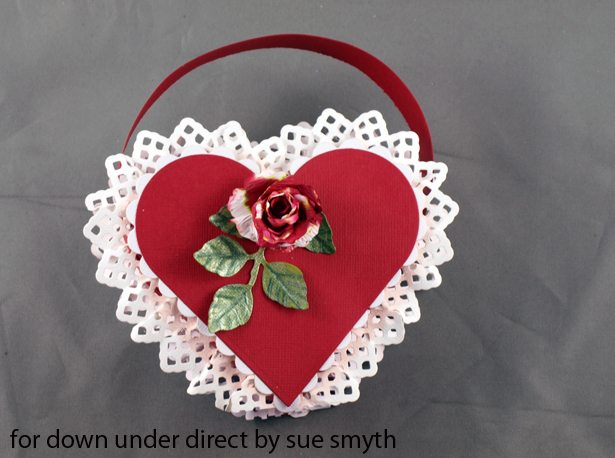 Using a sharp tool, make two holes and thread through some wire to hold the petals together. Twist the wire and cut. Spritz with Glimmer Mist and then bend and fold petals to give a distressed look. Dry with a heat gun. 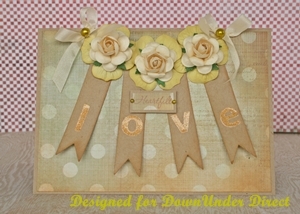 To finish flower attach a decorative button to the centre using some glue. 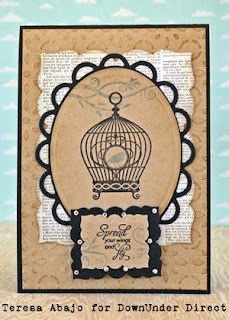 "Another Love themed card - again staying away from the more traditional colour scheme. It was serendipitous that the words 'now and forever' appear in the text. I simply highlighted them with a Copic marker. 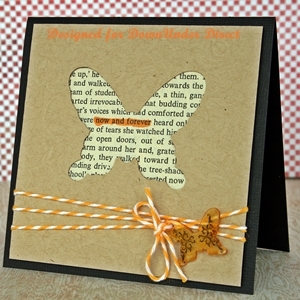 The little butterfly charm is made with shrink plastic. 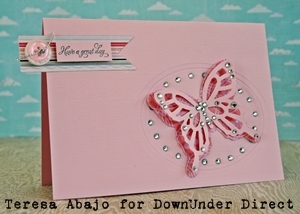 I cut it out using the same butterfly die I used for the centre of the card, stamped on it, and once it was shrunk I coloured the back of it with the same Copic marker I used to highlight the text Don't forget to make the hole for hanging it BEFORE you shrink it!" 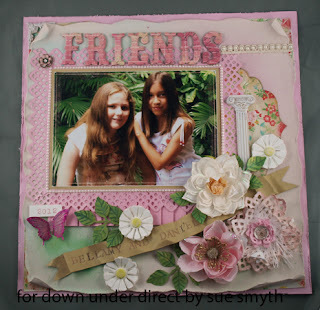 Today we have an Off The page Project from Sheree. "A sympathy card in neutral tones. 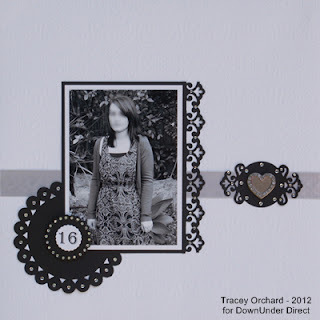 The card front has been embossed, although it is a little hard to see in the photograph. I added some dark micro beads to the flower centre, and the bow is shiny satin." Here is one more sample using the new BLING-abilities. So sorry everyone, I missed adding this one to my previous post. I hope everyone enjoyed our samples from yesterday. 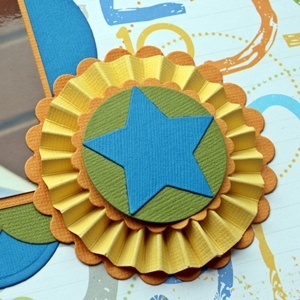 Here are some more BLING-abilities projects to inspire you. Today we have a fantastic new product to share with you. Introducing BLING-abilities. BLING-abilities™ was a concept that was conceived by Deb Boundy-Monk the owner of DownUnder Direct Wholesale approx 2 years ago when Deb and her husband were launching their Swarovski crystal clothing business. The sparkling hotfix crystal embellishment will now “give you the ability to Bling”! After much research, testing and sourcing throughout the world for the prefect crystal comparable to the brilliance of Swarovski we finally found what we were looking for and the product is now ready to be launched. While we also manufacture these products in Swarovski crystals the price point has been lowered due to the involvement of the Le Crystelle crystal. While a Swarovski stone has 14 facets making it the most sought after sparkle in the crystal industry and to which many of our garments and products are made from …our Le Crystelle stones have 12 facets which helps to hold it brilliance and sparkle, out shining the inferior self adhesive rhinestone crystal which sometimes have a 8 facet table if they weren’t so tumbled during manufacture that all sparkle is dissolved completely. Thus leaving a dull lifeless embellishment . Along with this our BLING-abilities have no ugly plastic glue bridges running between each crystal but rather each stone sits proudly on it’s own with correct positioning adding class and sophistication to your project. The result? Perfect embellishments that are not over crowded, misaligned or look simply unprofessional. These hotfix transfers are manufactured in Melbourne with the only machines of their kind in Australia giving us the ability to custom design anything you wish from business and corporate logos, to invitations and much more..maybe you can think of some of your creations or products that could use a shine or sparkle. Simply contact Le Crystelle for a quote today to custom design any embellishment for you. So now that you know what they are, here are some samples and a quick how to from the design team. 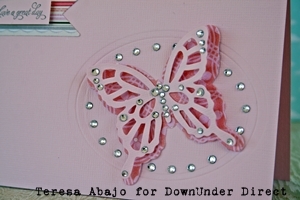 Remove your BLING-abilitiy from the packaging and cut out the desired shape from the crystal transfer. The pictures on both sides of the packaging can be used to see where shapes are positioned to prevent cutting incorrectly. 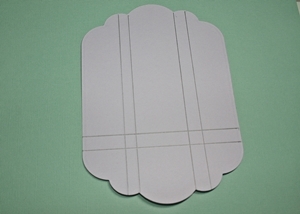 Peel off the white backing paper from your cut out shape. 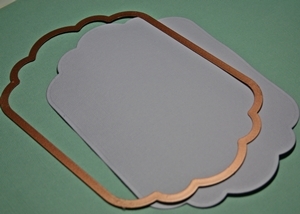 Carefully align transfer over your cut out shape. Refer to image on the packaging for exact placement of the stones. Prepare your iron for application by setting temperature to a WOOL setting and making sure that the STEAM function has been turned OFF. As all irons are different you may not have a wool setting and may need to experiment with the temperature. I found that a medium low setting on my iron worked fine. If the iron is too hot your transfer will not adhere correctly. Allow the iron to pre-heat. Place iron completely over the crystal transfer and press firmly for approximately 5-10 seconds. Try not to move the iron around on top of the stones as this may ause them to shift out of alignment. Allow transfer to cool enough to touch and then carefully remove clear film checking to see if the crystals have adhered. If crystals are still stuck to the film, carefully fold back and repeat step five. "Spellbinders make it so easy to hand make a flower to match any layout. In this layout I wanted to make some flowers that could be combined with a purchased flower and that you would not be able to pick which one is the bought one." 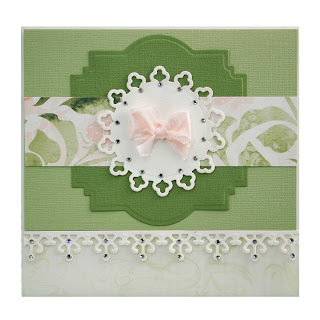 Here is a pretty card, suitable for many occasions. 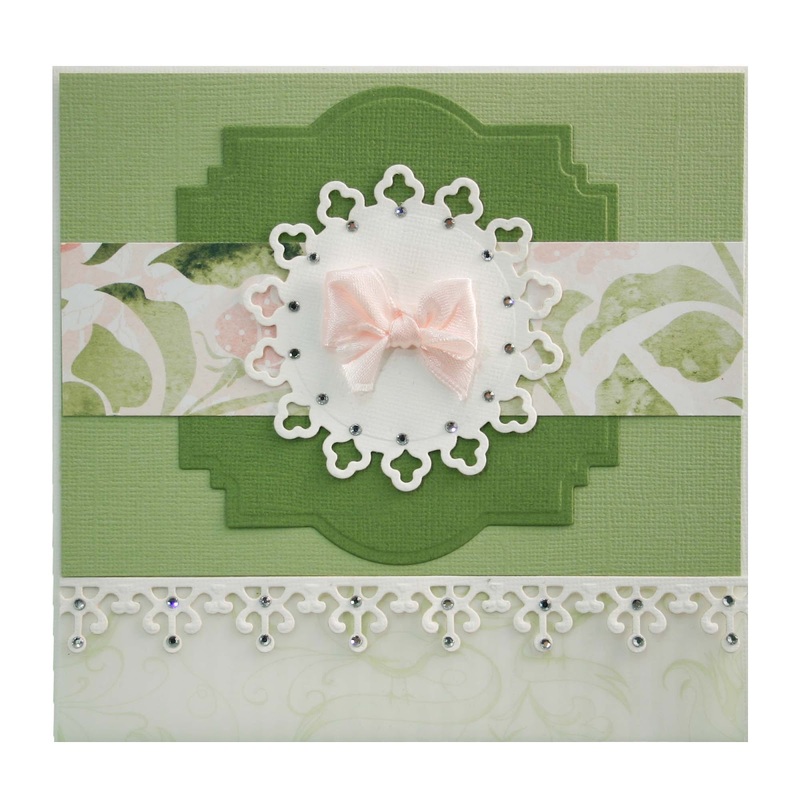 This folded card uses the Grand Scalloped Circles to form the base of the card, and Floral Doily Motifs to create the flower. Today we have a card to share with you. 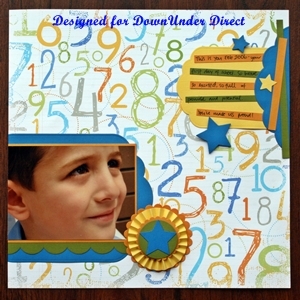 Today we have another layout from Sheree. 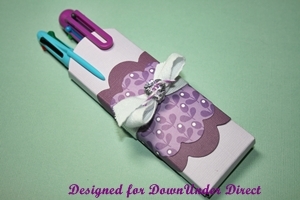 It's Tutorial Tuesday once again, and today we have a fun little pen holder for you. I can see lots of possibilities for this one...maybe candy canes at Christmas. Cut a Grand Labels Eleven using the Grand Calibur. Make score lines as shown in the photograph. (I have darkened my lines with pencil so that they show up better in the photo). Cut the corners off as shown. Assemble the box with your preferred adhesive (I used PVA glue). 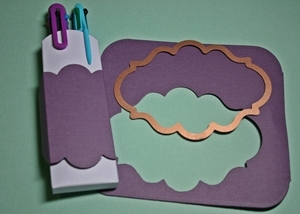 Cut a Labels Twenty from cardstock, and adhere around the front of the box. 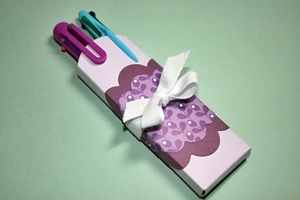 Cut a smaller Labels Twenty from patterned paper, adhere over the larger label, and tie some twill around the whole box. This will add extra strength and security. 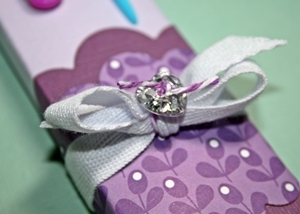 Tie a sparkly button to the knot of the bow to embellish. 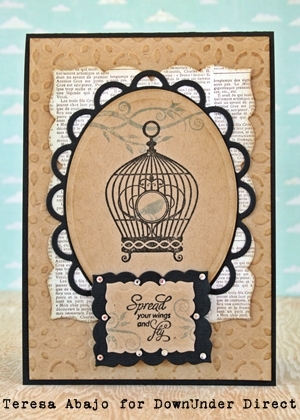 Today we have a pretty love themed card. "With all the children returning to school recently, I thought I'd dig out this photo of my son on his first day of school. The colours of Bazzill I chose are a slightly brighter shade than the colours in the patterned paper. If I had used the same shades, I feel the busy background would have taken over the main elements of the layout." Valentine’s day is easy with Spellbinders, perfectly cut hearts and flowers, can be quickly turned into a great treat basket.